Another Summer Tour has come and gone, and we’re back in St. Pete with our new album BOOGIE WOOGIE STAIRCASE. We’re very excited about this CD of 15 all-new originals, our first album since 2003 and our first studio album in twelve years, with special guest SMILIN’ MIKE DELANEY playing sax on two of the songs. Although we sold Boogie Woogie Staircase at all of our tour gigs, we didn’t release it in Florida until our return home in September. We played our 14th year at the CINCY BLUES FESTIVAL on August 2nd. Not long after our set on the Arches Piano Stage, we were called back onto the stage, along with ROB RIO (the L.A.-based piano master); to our surprise, the three of us were inducted into the BOOGIE WOOGIE PIANO HALL OF FAME! This was quite an honor; some of the previous inductees include PINETOP PERKINS, JOHNNIE JOHNSON (Chuck Berry’s piano player), BIG JOE DUSKIN, ANN RABSON, ALBERT AMMONS, and BOB SEELEY. Check out our PHOTOS page for pics taken at this event. Another tour highlight was playing at BUD & TOOTIE’S in New Philadelphia, Ohio (Doc’s hometown). Doc last played here forty years ago with his first band! We were also surprised when our good friend JUDY RADA (from Largo, Florida) walked in at Bud & Tootie’s. A great night with a number of Doc’s high school classmates in the audience. The last show of the tour was on Sunday, August 31st at the V CLUB in Huntington, West Virginia for the governor-declared DIAMOND TEETH MARY DAY celebration. As many of you know, we spread Mary’s ashes on the railroad tracks in 2000 after she died, and the WVBS is presently working to raise funds for a permanent memorial marker to be placed on this site (for memorial marker donations, please go to our LINKS page and click on “West Virginia Blues Society” link). The “Diamond Teeth Mary Day” event included the Proclamation Ceremony, reminiscences about Mary’s life, and performances by C&S RAILROAD and ourselves, with local TV news stations covering the event. Thanks to the West Virginia Blues Society for their efforts and to the V Club for providing their fine venue for this memorable ceremony. The WVBS plans to make Diamond Teeth Mary Day an annual event in Huntington. We were deeply saddened to hear of the Sept. 12 passing of JOE STRASSMAN, our great fan and friend from Ohio, who always came to our shows there with his wife, Beth. Our condolences to Beth and the family- we will miss Joe dearly…. Also, we are grieving the loss of our sister-in-law, MAURINE SHAMBARGER, who passed away on September 23rd at age 62 of cancer. Maurine and Doc’s brother Charlie lived in Lincoln, Nebraska where she worked as a nurse at St. Elizabeth’s Hospital. Our deepest sympathy and prayers go out to Charlie and their four children. Thanks so much to everyone who came out to the road gigs and CD Release Parties and bought our CDs and T-shirts. If you don’t have them yet or want more for gifts, please order from our STORE page. Word-of-mouth is the best advertising. Your comments about your favorite songs, etc. regarding the new CD would be welcome entries to our GUESTBOOK. Also, requesting songs from BOOGIE WOOGIE STAIRCASE or any of our albums to your local radio station would be greatly appreciated. If a station doesn’t have it, send them to our website to request a copy. 2008 has been a very busy year! Between January and March, we had seven weeks of company, including both our moms, Liz’s niece Alicia and her husband Elijah, as well as Liz’s sister Mary, all from Ohio. Our son Andrew had two surgeries in January and April, and is recovering at home in Virginia. In December 2007, we traveled down to Bradenton to hear our old friend STEADY ROLLIN’ BOB MARGOLIN at Aces Lounge. What a great show of deep blues, and Bob had us sit in with the band for a few tunes. Bob’s new CD, IN NORTH CAROLINA, is phenomenal. Also in December, we were sorry to hear that songwriter BOBBY HICKS died. We also lost pianist TRACY PURCELL, the “Saltwater Bluesman” in May. These two contributed greatly to the Florida music scene, and we miss them. Liz and I were featured along with JAMES PETERSON in Issue #64 of Britain’s JUKE BLUES magazine. The story and photo were submitted by Belgian writer ANDRE HOBUS. Speaking of print, two books we recommend are MAKING RECORDS by Phil Ramone, and THE PIANO SHOP ON THE LEFT BANK by Thad Carhart; if you love Paris and/or pianos, this is a fascinating read. The state of West Virginia has declared August 30th as DIAMOND TEETH MARY DAY! We’ll be part of the festivities in Huntington, WV. Mary would be so proud! After weeks of rehearsal and planning, we laid down basic tracks for our next album on April 1st and 2nd at PROGRESSIVE MUSIC studio in Tampa. We recorded a few more tracks and mixed there in May. After a photoshoot on May 26th, the artwork and graphics are now in progress. With a release set for late July, our summer tour gigs will be all CD Release parties. It’s been a tremendous amount of work, details & decisions, but now that it’s almost done, we’re getting very excited for all of you to hear it. A lifelong dream came true on April 25th when we opened for LEON RUSSELL at Bourbon Street Night Club in New Port Richey, Florida. Liz has loved Leon since her uncle Ron Clark turned her on to him at the age of fourteen. He became a major piano influence and inspiration. After first seeing Leon live in 1973, Liz has been to many Leon concerts since, but this was the first time to appear on the same bill- what a thrill! Leon sounded as amazing as ever & had a fine band with him. Leon also said a few words to Liz backstage after the show, which hasn’t happened since we met him briefly after a show in Wheeling, West Virginia in 1988. Visit Leon Russell’s website (on our LINKS page) to order his albums and learn more about this legend’s incredible career. The rain on June 18th, 1983 must have indeed been good luck, as next week Liz & I will celebrate our 25th Anniversary! We hope that you will share our joy at our June gigs, as we love you all and consider you part of our family. Thanks for being there and sharing our musical ventures! When we moved to St. Pete in 1996, We knew we’d have to play a lot of local Tampa Bay area steady gigs to survive and pay the bills in between the occasional road trips. And we’d need a lot of fans showing up at those gigs to help pay the club owner’s bills and keep us coming back. We noticed some of the same faces in the crowd night after night & thought of a small, fun way to thank them, encourage them to keep coming back & to get more folks to come out more often. So, we got some cards printed up, handed them out, & stamped each person’s card at every gig they came to. When their card had 10 stamps, they chose a prize from the prize bag. The FREQUENT FAN cards started in 1998-2000. Withholding last names to protect privacy, those early winners were: Steve & Gail, Ron & Audette, Donna, Bob N., Bob & Debbie, Ed & Marian, Just Old Bob, Brian & Pam, Audrey, Les, Digger & Theresa, Walter, Pat, Terry, Dennis & Pete. When we brought back the cards in 2003 through 2007, these winners were added: Terry, Yankee Bill, Judy, George, Mary & Ralph, Shirley, Jack, Lovey, Dan, Marv, Mama Blues, Doreen, Bob & Gwyneth, Ralph & Hildegarde, Marlyn, Opal, Harriett, & Steve. The winners list would be much longer if everyone remembered their cards at every gig and if every fan participated. 9 winners- Les, Jack, Marv, Mama Blues, Ralph & Hildegarde, Marlyn, Harriett, & Steve- actually live up north, yet they won by coming to shows there in the summer & Florida visits in winter. Unfortunately, some have moved away, and at least 3 are no longer with us: Digger, Lovey & Ralph, who we miss seeing in the crowd. Many won several times. Doubtless, our #1 Frequent Fan has to be Terry, who won 6 times (that’s 60 gigs!) in 2007! He also won, amazingly, 8 times in 2004, 6 times in 2005, & 10 times in 2006!! He may be the only person who’s heard every one of our 200+ songs, seen every gig outfit we’ve ever worn, & witnessed a lot of joy, sadness and craziness along with us. Terry so appreciates live music and is kind, fun, empathetic & generous. If we only had 50 more like him! He’s the one who wrote the lyrics (and I put them to music) to “Straight At Me” which will be on our next CD. You can find Terry at most of our Florida gigs, often accompanied by a tiny sweet lady- his mom, Mary- who’s won 24 times herself. Her favorite songs are my newer originals “Boogie Woogie Staircase” & “Last Song” which will also be on our next CD. They’re Indiana natives. Another Frequent Fan jewel is Judy, who won five times in 2007, 9 in 2006, 5 in 2005, 4 in 2004 and 1 in 2003. Originally from Ohio, Judy is also kind, fun, empathetic, generous, + a talented cook and floral designer. She brings along many friends & family members. One of those is Opal from Iowa, who has survived cancer, heart disease & arthritis, yet still comes out often & inspires us with her fun spirit. She obliterates most excuses anyone could have for not going out. More top winners you’re likely to see are Dan (usually sporting a great Florida shirt), Yankee Bill & Doreen (who request songs #11 & #56) & the great dancing snowbirds from Ohio, Ralph & Hildegarde, who write their favorite songs on the back of their Frequent Fan cards, then have to rewrite them all when they win & have to turn in their cards. The great thing is that all these folks have become friends with us & each other, and gigs become reunions/parties. Anyone & everyone is most welcome! Music is the glue that bonds us all. Musicians can never have too many gigs or too many fans. We know that you sacrifice a night on the couch in front of the TV, your precious time, hard-earned money, & expensive gasoline to come out to gigs, and we never take that for granted. Whether you come out every night or every ten years, we’re glad to see you & know YOU keep us working & music alive. Every single face in the place counts (and believe me, many club owners are counting!) Playing at home is fine, but sharing music with an audience is much better. There’s nothing like the high of looking into someone’s eyes while playing a song & connecting on an indescribable level. Every single show is a unique experience with a different ambience, combination of songs and people. Our Frequent Fans can attest to this & can tell you that you don’t know what you’re missing when you’re not there. We look forward to seeing all of you Frequent Fans, past & present, at many gigs in 2008. Don’t forget to bring your card with you (no more back-stamping in 2008), and bring along some new folks, too! And any of you who’d like a free card, just ask at any gig- we’d love to add you to the “Liz & Doc Support Group” & the FREQUENT FAN Hall of Fame. Thanks so much, God Bless & we’ll be looking for you. It’s hard to believe that the holidays are here again. We’ve been having a busy fall since we returned from our Summer Tour. On September 29th, the SUNCOAST BLUES SOCIETY featured us with a Spotlight Series Show at BEAK’S OLD FLORIDA on Central Ave. in St. Pete. A very nice turnout, and it happened to be SBS president KEN TORVIK’S birthday, celebrated with cake and song. Also in September, we made a road trip to Cocoa Beach to play at the BEACH SHACK BLUES BAR on Saturday, Sept. 22nd. Right on the Atlantic Ocean, the Beach Shack plays host to national and regional blues acts. It was great to be over on the East Coast again. 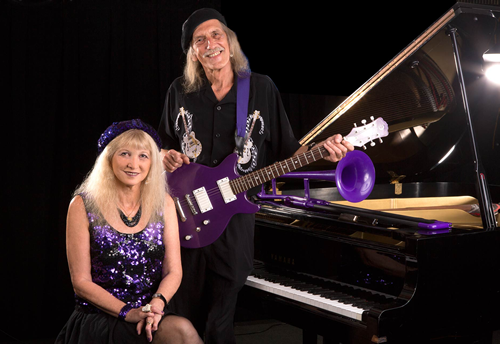 In October, Liz & I did two special shows: We performed a LARGO SUNSET SOUNDS Concert in Ulmer Park on October 12th, then went to Dunnellon, Florida the next day to play at the JAZZ UP DUNNELLON FESTIVAL. This was our sixth year at this festival, a fine street event, along with sixteen other bands. The weather was fabulous, and we had a great time. We want to thank three blues-oriented radio stations who are now giving airplay to our CDs: WPKN-FM (Bridgeport, CT); WFYI-90.1FM (Indianapolis, IN); and WCSB-89.3FM (Cleveland, OH). Please give them a listen if you get the chance, and call in a request at your favorite radio station. Our sympathy to the family of RALPH GREGORY who passed away in St. Pete on November 17th, especially to his wife MARY and son TERRY. The Gregory’s have been among our most loyal and generous supporters in Florida, “Frequent Fans” many times, and very good friends. We’re very thankful for all of you who have come out to support us in 2007. Merry Christmas and Happy Holidays! Our 2007 Summer Tour was a great success, covering five states in six weeks. Once again, the tour began in Cincinnati, Ohio; this year, we played at the “BEATING THE MELANOMA BLUES” fundraiser in Cincy at the Frisch Estate (of Frisch’s Big Boy fame) on Thursday, August 2nd, with many of the boogie woogie piano players from the Arches Piano Stage performing. It was terrific to see AXEL ZWINGENBERGER from Germany again, and to meet LLUIS COLOMA from Spain. The Friday night Piano Party at DR. LEMING’S beautiful new home was a delight- delicious food and good music! Then, on Saturday, we did the CINCY BLUES FESTIVAL, our 12th year at this fine fest, before moving on to other shows. As usual, we saw many familiar faces, friends, and fans in our summer travels, but this tour, we also saw people we hadn’t seen in years. Three of Liz’s high school classmates came out to shows: ROBIN in Indianapolis, and RON & LISA RUCKER in Cleveland. STEFANIE GRIFFIN, Liz’s old friend from her Tucson years, also drove from Champaign, Illinois to our SLIPPERY NOODLE show in Indianapolis! Liz’s cousin, STEVE LEWIS, and his wife showed up at the FRONT ROW in Parkersburg, West Virginia (this was their first time ever hearing us), and our old pals JOE & DEB FINLEY came to our Marietta show- we hadn’t seen them in at least twelve years. It was wonderful to see all of you again! More surprise show-ups from the Summer Tour: Liz’s cousin & keyboardist GARY LEWIS appeared at our RASCALS gig in Dover, Ohio and our good friend JOE REED showed up in Marietta as well. Another big surprise was at the SLIPPERY NOODLE (Indianapolis) when our Florida friends JUDY RADA and HARRIET walked in with JACK BAILEY. We were floored to see them there! We had not played in several towns for years until this tour. One was in Cleveland at the SAVANNAH BAR & GRILL (our last gig here was seven years ago). Many of Doc’s cousins came, and we had a fine time. Then, we played our first show in twelve years in Morgantown, West Virginia at RHYTHM & BREWS on September 4th, where a number of old fans showed up. CAROL WENDLAND & FLORETTE ORLEANS (both of whom we met at Blues Week In Elkins, WV around 1992) came, Florette with percussion washboard in hand. Then, to our surprise, NICK CAVOTI and friends came in with copies of our old albums. We had met Nick in Marco Island, Florida about eight years ago and had not seen him since until this show. DILIP TRIPATHY (from Cincy) wins for attending 4 gigs in 4 different cities, as well as THE GRUSECK’S coming to 5 gigs in 4 cities! Our tour ended in Fredericksburg, Virginia at the COLONIAL INN on September 7th. Once again, we were surprised when BEN KEYES, a fan from St. Pete, walked in. Also there were Doc’s son DREW SHAMBARGER and his friends. It was great to spend a few days in Fredericksburg with Drew, who graciously put us up in his beautiful home and showed us around town. We also got to hang out with SAFFIRE members GAYE ADEGBALOLA and ANDRA FAYE at a jam session ANDRA was hosting in Stafford, Virginia, and we had a chance to jam with them as well.